What makes aquatic therapy unique? Buoyancy: Things float in water. Buoyancy decreases the amount of weight bearing for patients, which in turn reduces the force of stress placed on their joints. By decreasing the amount of joint stress, there is less pain and exercises are easier to perform. This aspect of aquatic therapy is especially useful for patients with arthritis, fractured bones, or who are pregnant or overweight with an injury. Hydrostatic pressure: This natural pressure in water has been found to reduce the swelling in joints and soft tissue that is usually associated with arthritis or injury. Viscosity: Water creates a source of resistance that allows for muscle strengthening without the need to use weights. Coupled with water’s buoyancy, this allows a patient to strengthen muscle groups with decreased joint stress that cannot be experienced on land. Relaxation. Water promotes muscle relaxation, which eases movement and pain. These unique benefits of aquatic therapy can help you start to exercise and restore your ability to function like you once did. 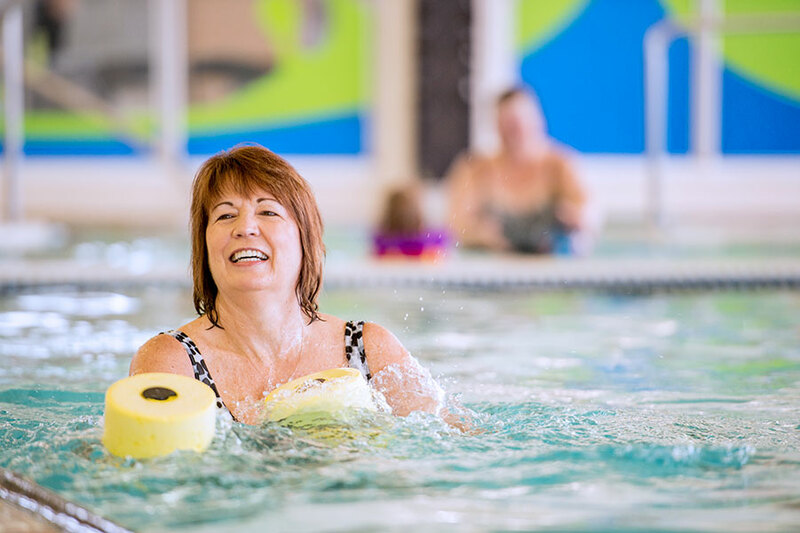 Eventually, aquatic therapy can allow you to progress to a traditional land-based exercise program. What can patients expect from aquatic physical therapy? Patients will appreciate the many benefits that can be attained through this treatment. Improved joint flexibility: Buoyancy offers a tremendous advantage because it reduces the effects of gravity and allows for increased joint range of motion. The affected part of the body will float, making it easier and less painful to move. The warm water also helps to relax muscles that are sore or tight. Increased muscle strength: Water is 600-700 times more resistive than air, which allows for strengthening of muscles. Water resists rapid movement, so the faster you move, the more resistance you get. Reduced pain: Immersion in warm water increases an individual’s comfort by increasing blood supply to sore muscles and promoting relaxation. Weight relief to weakened body structures also creates additional comfort. Decrease in abnormal tone, spasticity, or rigidity: Water temperatures above 92 degrees, in conjunction with hands-on techniques, are effective in creating a gravity-eliminated environment that reduces tone due to a neurological condition. Improved balance: The uniform pressure of the water, along with buoyancy, provides support to your body. This allows for more time to react without the fear of falling or getting hurt. While aquatic therapy is an excellent option for some individuals, not everyone is a candidate. Please consult with your physical therapist or physician to see if aquatic therapy is for you. Lifespan Rehabilitation offers aquatic therapy in Providence and Newport. For questions or for more information, visit our website. Denise Garceau is a senior physical therapist in Lifespan Rehabilitation.